Occasionally when I’m proctoring my Test Track environment users will “accidentally” move vmnic0 on a host from the default vSwitch0 over to a Distributed switch. 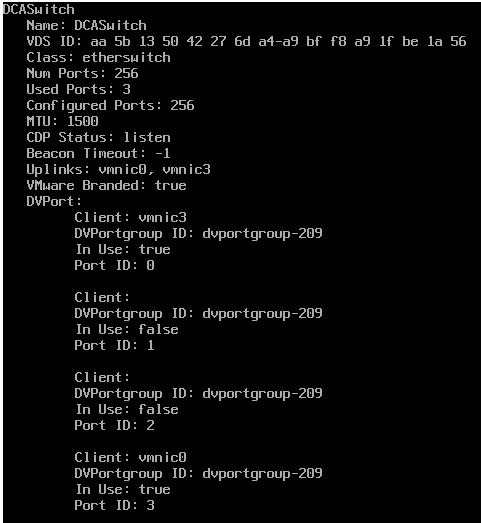 As management traffic only runs across vSwitch0 I lose access to the host until I fix it from the command line. I’m mostly posting this so I can quit looking up the command sequence each time. and find the switch that vmnic0 was moved to. Note the switch Name and Port ID. This entry was posted in Network, Virtualization, VMware. Bookmark the permalink. The first time I made this oops I used the console to reset the management networks. It undid the change but there weren’t any production distributed switches. Does beg the question – Will VMware ever support a vCenter cluster with all of the nics assigned to distributed switches? Where did you hear a pure vDS solution is not supported? I can’t find any indication that it would not be supported? How to do the reverse, I mean move a vmnic from vSS to vDS ? My question as well, old thread but still.. valid question.